Our Greenhouse IPM (Integrated Pest Management) program is falling into place. Beneficial insects and nematodes have been released in the greenhouses. (See https://uribotanicalgardens.wordpress.com/2012/01/11/the-good-the-bad-and-the-ugly.) 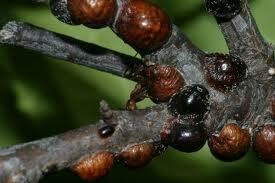 But this week I found an unlooked for ally: Cryptolaemus montrouzieri, commonly known as “mealybug destroyer”. “Crypts” are in the order Coleoptera, which are beetles. 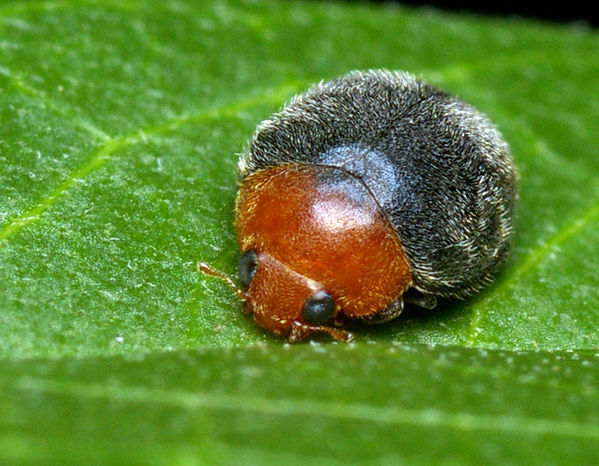 This particular ladybird beetle is native to Australia and was introduced to the United States in 1891 by one of the early biological control pioneers, Albert Koebele, to control citrus mealybug in California. It cannot overwinter in our climate outside but does survive in the greenhouse. The adult is a small dark brown beetle with a reddish brown head — no spots. 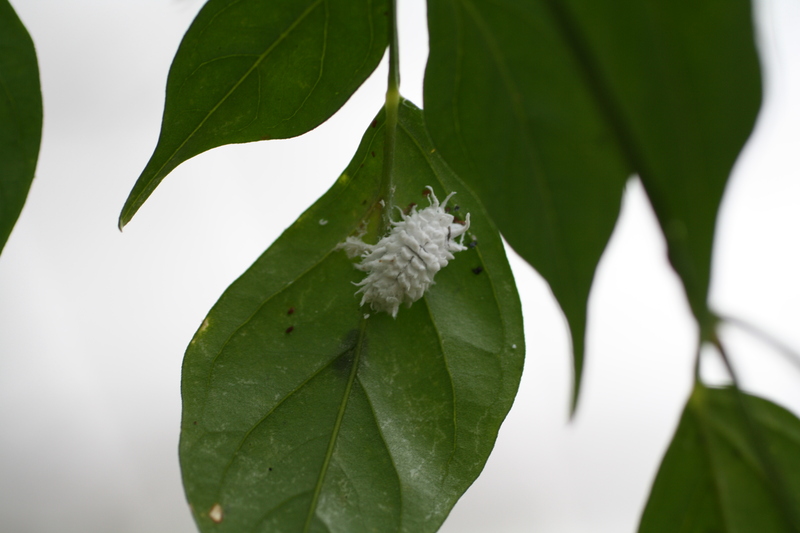 The larvae strangely enough look very much like mealybugs — covered with waxy white filaments. They are distinguished from mealybugs by their size, almost twice as big as mealybugs, and by the fact that unlike mealybugs, they move quickly. They are gobbling up mealybugs and scale insects in the greenhouses. 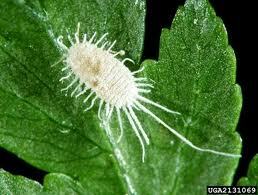 The Cornell University biocontrol website says that a single “Crypt” can eat up to 250 mealybugs. Because it does not over winter, techniques for mass rearing this beetle were developed for its release during warmer months. 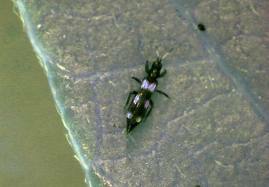 It is readily available from beneficial insect suppliers but tends to disperse when released. Finding a Cryptolaemus population already living in the greenhouses is a bonus! This entry was posted in Conservatory, Greenhouse, Photography, Uncategorized and tagged beneficials, biocontrol, greenhouse, insects, IPM on March 15, 2012 by uribg. You can’t really ignore bugs if you’re a gardener. They are always there, sometimes causing problems, and sometimes just being stunningly beautiful. Lately, the bugs in the Conservatory, and all the greenhouses, have been problematic. This happens every winter. My theory is that the “bad” bugs are always around, but in the summer, the plants grow faster than the damage, and the vents and doors are always open, allowing “good” bugs a chance to come in and get populations under control. But right now, the plants are just barely growing with the days so short, and the bad bugs are having a field day! Yesterday, I spent a few hours going through the greenhouses with Elwood, looking at the plants and collecting insects to check out under the dissecting microscope. This is one of my favorite things to do, and I’m lucky to have Elwood to help out. He knows the good guys and the bad guys very well, having managed an IPM program at a local greenhouse. IPM stands for Integrated Pest Management, and is an approach that uses comprehensive information on the life cycles of pests, and their interaction with the environment, to manage pest damage by the most economical means, and with the least possible hazard to people, property, and the environment. It involves identifying and monitoring populations of insects, using cultural/preventive methods (such as crop rotation and resistant varieties) , and using control methods when necessary, evaluating the control method both for effectiveness and risk. 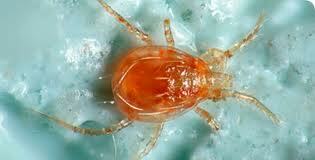 Effective, less risky pest controls are chosen first. Right now we are evaluating our greenhouses and pest populations for a fascinating part of IPM: Biocontrol. 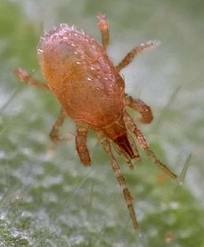 Biocontrol is the planned release of natural enemies of pests. 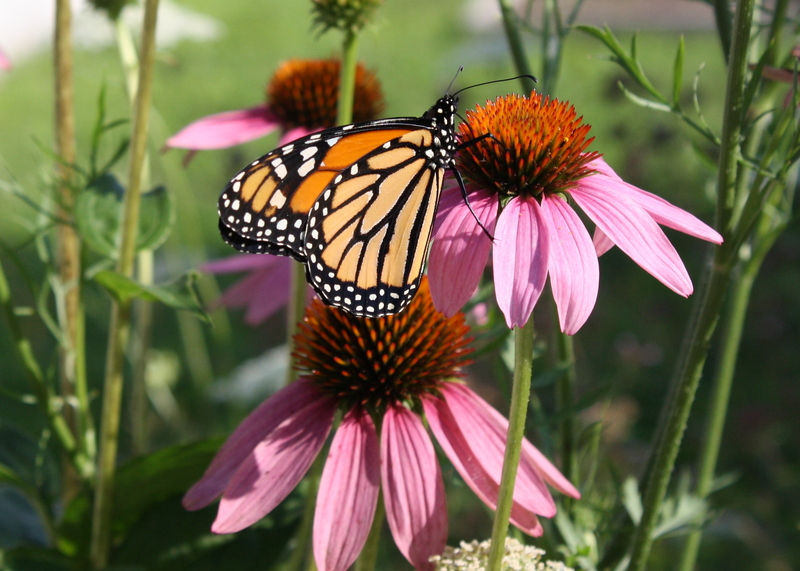 These natural enemies can be other insects — predators or parasitoids — or pathogens (diseases). (It can also mean an insect which eats only a specific plant, as a control of invasive plant species). URI is home to the Biological Control Lab, a USDA approved Quarantine Facility, for newly imported exotic biological control agents, and also an insect rearing and research facility for accepted biological control agents. Lisa and Dr. C manage the Biocontrol Lab, and they are a wealth of information! I pester them constantly with questions. By next week, we should have a good idea of exactly which bad guys are present, and how numerous they are, then we send away for our Natural Enemies to release in the greenhouses. Stay tuned! 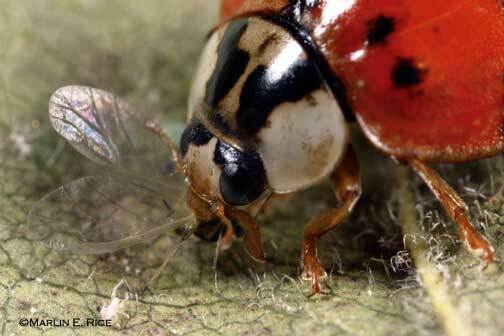 A natural enemy at work: Asian lady beetle eating a winged soybean aphid. Photo courtesy of Iowa State University. This entry was posted in Conservatory, Greenhouse, Photography, Plants, Uncategorized and tagged biological control, greenhouse, insects, IPM, natural enemies, plants, winter on January 11, 2012 by uribg.